A Stockton-based cleaning company has been given the job of brightening up the external cladding of a Middlesbrough landmark. 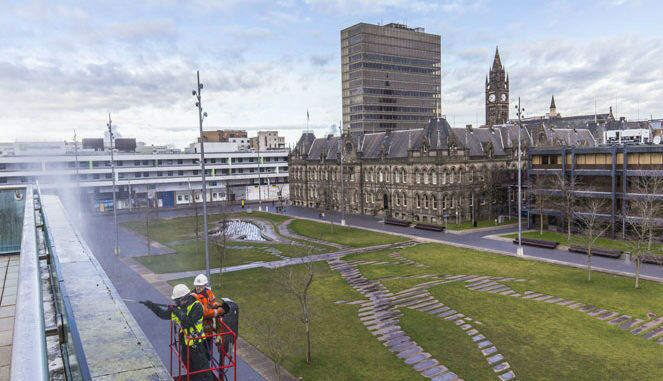 Precision Cleaning Northern, led by Paul Suttill had the task of cleaning the rare Turkish Limestone that covers one of the walls of Middlesbrough Institute of Modern Art (mima). Established now for 10 years, mima has become an integral part of the regions art and culture scene. The design of the building has its own story and the side of the building is very light in colour and stands out within the town. The cladding is made from Turkish limestone and is the only building in the area to have this. However, time has meant that the surface has had the impact of being exposed to the elements. Precision Cleaning Northern has been established for 13 years and has developed an excellent reputation for high quality external cleaning. Run by Paul Suttill, the business has built a range of clients across the region from hotels and universities to sports arenas. This latest work forms part of the future plans for the business. The company is looking to specialise in cleaning historical properties and unique properties of interest. To support these growth plans, the business has applied for grant funding to help towards investment in machinery and the recruitment of more staff. So, confident about the standard of work that Precision Cleaning can do, Paul has filmed this latest project and the video is available on his website. Suttill said: “I was so pleased to win this work. Especially as mima is such a major building within the town. “My business is developing all the time and I have found a real passion for working on unique properties and this is something I am eager to progress. “The experience with mima has been great and will be a springboard into more opportunities.